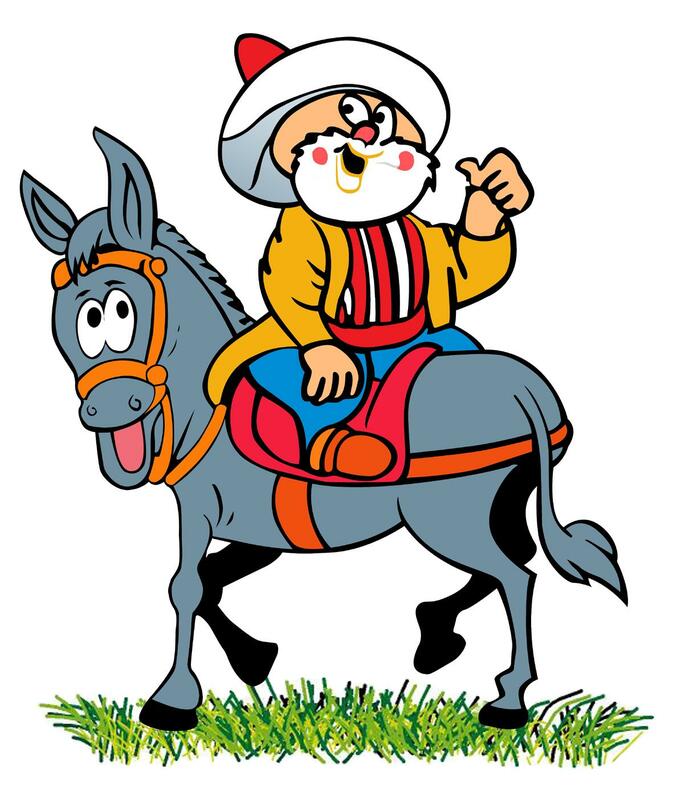 Nasreddin Hoca (read Hodja, which means ‘scholar’ or ‘teacher’ in Turkish) is a popular historical (13th century) figure and an imam known for his wit, wisdom and courage. By means of humour, he wanted to bring the vices that were widespread in the community (e.g. backbiting/slander, stealing, corruption) to the attention of the people -which he was very successful in doing. Therefore many of his quotes/experiences were passed down the ages. However, as time passed, many stories which fit the characteristics mentioned above, whether it belongs to him or not, were associated with him. Click for a selection of his stories in English: (i) Tales of the Turkish Trickster* (ii) Other stories attributed to him. Click for Wikipedia page. PS: We need more of his kind today… Especially in the ‘Muslim’ world! Nasreddin Hodja, needing a large pot to cook a stew, borrowed his neighbor’s copper cauldron (a large pot), then returned it in a timely manner the next day. The neighbor, thinking that the Hodja had gone quite mad, did not argue. The neighbor had a nice little pot and he was happy with the outcome. “Why not?” Perhaps there will be another little pot inside when he returns it.” thought the neighbour to himself. Moral of the story: There are many things that we can take from this story but the main one is that we shouldn’t lie our way into tricking others for our personal gain as it can come back to haunt us. The Hodja was invited to a banquet. Not wanting to be pretentious, he wore his everyday clothes – only to discover that everyone ignored him, including the host. So he went back home and put on his fanciest coat, and then returned. Now he was greeted cordially by everyone and invited to sit down and eat and drink. Moral of the story: He powerfully presents that it’s the person that should be valued and not the fancy things that one owns. Nasreddin Hodja was lying in the shade of a walnut tree. His body was at rest, but, befitting his calling as an imam and scholar, his mind did not relax. He started contemplating; looking up into the mighty tree, he considered the greatness and wisdom of Allah/God. After a while the Hodja dozed off, only to be awakened by a walnut that fell from the tree, striking him on his forehead. Moral of the story: We shouldn’t question the wisdom of God/Allah – or things/phenomenon that we cannot fully grasp. In old times wise men would travel around the country, extensively searching for facts or ideas to support their newly-formed theories. Three such men one day arrived in Aksehir, and calling on the governor, asked him to summon the most learned man of the district to be present at the market place the next day – so that they would see whether they could profit from his wisdom. As the most wise man of Aksehir, Nasreddin Hodja was duly informed and the next day he was there and ready for, what proved to be, a battle of wits. Quite a crowd had gathered for the occasion. There was nothing more to be said, so the first wise man withdrew. “Let me ask you this,” said the second learned man, stepping forward. “As many as the hairs on my donkey’s back,” was the ready reply. This silenced the second wise man, upon whose withdrawal the third one stepped forward. “Since you seem so well acquainted with your donkey,” said the third man sarcastically. Needless to say the third wise man had no desire to try the experiment, they realised the greatness of Hodja. Moral of the story: As we say in Turkey, “akıl akıldan üstündür” which means (with a lot lost in translation): Two heads are better than one. There’s always someone out there whose wisdom is useful. We should always search for them to make better decisions. Reblogged this on UBU Turkish Society.